The precedent post showed the need for the panStamps to communicate with other wireless devices. The target of this project is not to provide just a CC1101 driver for DIY arduino projects but also develop the necessary libraries and tools to create a complete wireless ecosystem. 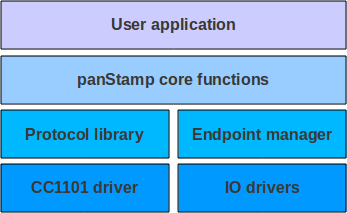 Therefore, the course of the panStamp project will be accompanied by the development of a series of libraries and applications, being the CC1101 arduino driver the first of them. Once assumed that we need a protocol, which one could we use for the panStamp project? I've been doing the search for some time but I've not found any open protocol, compatible with the CC1101 interface, with the sufficient popularity to be considered as a standard. This leads us to consider the creation of a custom protocol for this project, specially adapted to take advantage of the features provided by the CC1101 IC.